The latest personal transportation initiative to hit Columbus is scooters. Electric scooters, to be sure — but still . . . scooters. 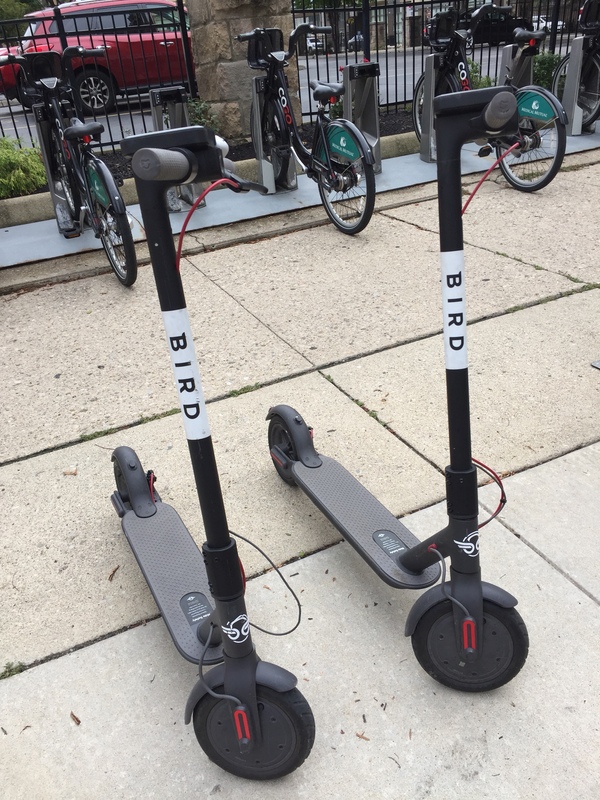 A company called Bird has identified Columbus as a location for its rent-a-scooter program, and now you see the Bird scooters all over the place, like this duo that I found at the corner of Gay and Third on Sunday. The Bird scooter program sounds a lot like the Cars2Go program that was launched in Columbus several years ago — and which was discontinued earlier this year. Bird users tap an app that allows them to unlock a scooter for $1, and then they pay 15 cents a minute as they ride. The scooters can travel up to 15 mph, can only be used during daylight hours, and are supposed to be ridden on the street or in bike lanes and not on the sidewalks. (Speaking for pedestrians everywhere, I’m grateful for that last caveat.) Based on an article in the Columbus Dispatch, it appears that Columbus and surrounding communities are trying to figure how how the Bird scooters fit into the current rules regulating transportation options and whether permits and other requirements should apply. The scooters are supposed to target people needing “last mile” transportation, and I’ve seen a few people riding them around. I wouldn’t use one, but if the Bird option gets more people out of their cars and using the bike lanes, that seems like a positive thing to me. Mostly, though, I’m amazed that scooters — which date back to at least the ’30s in America — have reemerged as a transportation option. What’s next? Rentable pogo sticks?